But punk didn't completely vanquish the old guard; groups like Led Zeppelin, the Who, Genesis and Pink Floyd were still immensely popular by the early 1980s. A few unique acts like David Bowie and Roxy Music were able to straddle the line between being from the establishment and serving as an influence to the punk groups. And in the early part of their careers, the members of the Police masked their previous progressive/jazz rock chops and created music that (just about) passed for punk. There are no denying that several songs on News Of The World borrowed aspects of punk, so it is natural to assume that the band was jumping on the bandwagon. But Queen had already recorded songs that hinted at DIY aggression. On the band's 1973 self-titled debut, Roger Taylor's 'Modern Times Rock ‘N’ Roll', ironically a tongue-in-cheek commentary about rock and roll trends, was a nearly two-minute aggressive blast of proto-punk. Other earlier Queen songs like 'Ogre Battle' (from 1974's Queen II) and 'Stone Cold Crazy' (from 1974's Sheer Heart Attack), blended both punk and metal elements that foreshadowed thrash. There are some other punk elements on News of the World: the slow tempo, march-like grind of 'Fight From The Inside', also written by Taylor, with its nihilist and cynical lyrics: “You're just another picture on a teenage wall/You're just another sucker ready for a fall.” While Mercury was more known for crafting grandiose pop music, his 'Get Down Make Love' showcased a raw and raunchier side of his songwriting —there's no doubt what that song's subject matter was about (Nine Inch Nails would later cover the song). And the last 37 seconds of the album's penultimate track, 'It's Late', May's angst-ridden composition about a love triangle, is pure head-banging bliss. 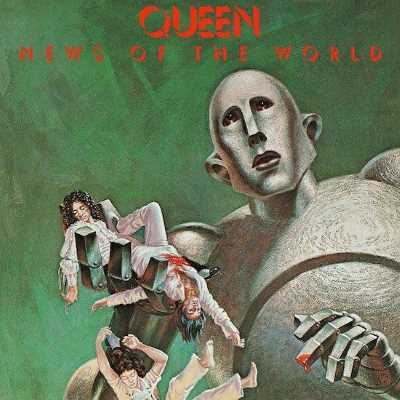 Not surprisingly, News Of The World was a hit record, continuing Queen’s winning streak on the charts. In his somewhat complimentary Rolling Stone review at the time, Bart Testa wrote: “Most of the songs on News Of The World either challenges Queen's artistic enemies or endeavor to establish a version of the new order. Late sons of the Empire though the may be, Queen has nothing to fear or to do. In their moneyed superiority, they are indeed champions.” Years later, Guns N’ Roses guitarist Slash offered his enthusiasm of the record, singling out two of the punk-driven songs: “When they dug in to do something mean or hard, they could do it better than anybody. News Of The World has 'Fight From The Inside', one of my favorite Queen songs, and also the brilliant 'Get Down Make Love'. This is just my favorite end-to-end Queen record."